In order to meet the challenges of today’s work force, students need to be equipped with a broad base of knowledge and the tools necessary to communicate with competence and confidence. Our Discovery Time enrichment will stimulate students’ interest in a variety of topics, broaden their knowledge base, and provide opportunities for them to communicate what they’ve learned to others! Discovery Time is strategically introduced and promoted in each grade level of Shurley English. Lessons are designed to spark students’ interest in self-guided research as a way to broaden their knowledge base. Of course, 40+ years of research proves that when learning new information about a topic, prior knowledge greatly impacts a students’ ability to comprehend, draw inferences, and figure out ambiguity. A broad base of knowledge also helps students think of new ideas related to the topic. Facts about different topics are presented to students during Discovery Time. Students have the option to pursue any of the topics for further exploration at the library, at home, or on the Internet (with parents’ permission). After investigating a Discovery Time topic, students may write and publish an independent report to share with others. 1. 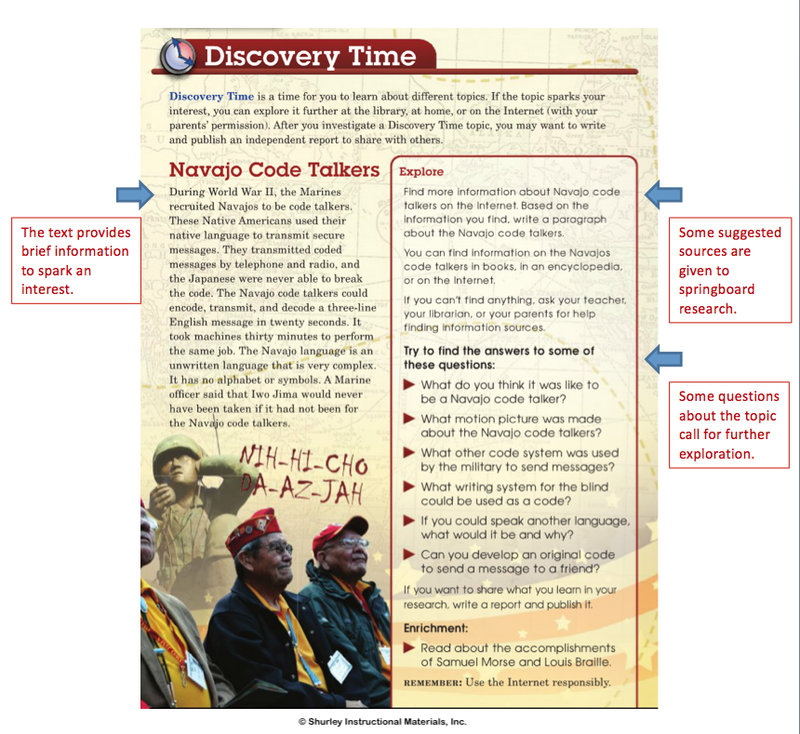 First, students are provided with some interesting information about the Navajo Code Talkers from World War II. 2. Next, students are given several questions to answer that will require more research. 3. Finally, students are challenged to share what they have learned by publishing a report.